Breath of Fire is significant to Capcom for being their first real RPG. The game was released in 1993 and the original Japanese artbook ブレス オブ ファイア オフィシャルコンプリートワークス was released in 2005 and then reprinted in 2010, and now in 2014 Udon has translated the book to English as a large 192-page paperback. 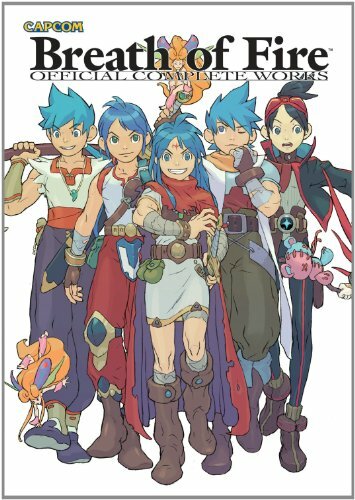 The book features the concept art from Breath of Fire I to V.
The promotional and cover art gallery appear in the first few pages. Art for the re-release games are also included, e.g. the first game came out in Super Nintendo and the re-release was for Game Boy Advance. You get to see the new promotional art created for those re-releases. The rest of the book are mostly character designs with a bit of background art. It's interesting to observe the evolution of art from the first to the last game. Early artworks from I & II look like they were coloured illustrations drawn for manga in those times, with III and IV the colouring is more anime like with clear edges that define colour changes, and then in V it has more refined colouring. The quality definitely matured and improved with time. This book is actually part concept art part visual companion. Characters come with character profiles, and for concept art there are the commentary from designers. There's a nice mixture of coloured art and line sketches. The art looks beautiful with lots of fantasy creatures and beasts to check out. In the game, main character Ryu gets to transform into dragons, and you'll get to see those dragons in the book. Enemy designs have the art direction of typical desktop RPG games. Here they are more stylized than hyper-realistic. I guess if you look at the stylized character designs, you can sort of expect the creatures to exist in the same world. For Breath of Fire fans, this book is going to be a trip down memory lane as you look at artworks that were created more than 2 decades ago when the first game just came out. It's a great book for the fans. Quite worth the money.